Tools and search engines, and their characteristics; Global business information; Do you know your customer? Terrorism, surveillance and corruption; Where next? What’s new? Next generation social networking tools to enhance research outcomes; Conclusion; Fun stuff. 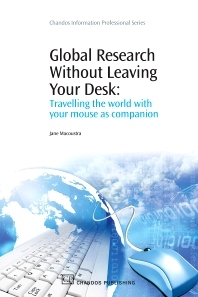 Provides a broad scope for research to take the frustration out of not being able to locate what you want, not just by country or region, but how to pinpoint and access reliable information on a global scale. Other issues addressed are Know-Your-Customer issues, corruption and terrorism and new Web 2.0 technologies. Jane Macoustra has 27 years experience as an information professional, working in oil and gas, investment banking and legal and compliance. Amongst her varied career she has also taught information literacy and advanced internet skills in higher education. She is currently serving as a Director on the Board of the Special Libraries Association (SLA) – Europe and is also Sponsorship Chairman for the SLA Asian Chapter. She is past-President of the SLA Asian Chapter 2004-2006. In 2007 Jane won the SLA Presidential Citation Award for her work with the Asian Chapter.